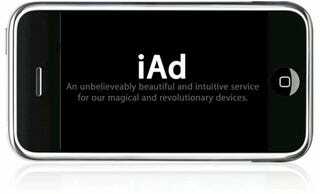 MediaPost reports that Apple's next next big thing, after iPads invade the world next weekend, will be iAd, a mobile advertising platform to be debuted April 7. Coffee dates and patent suits aside, this could be the true Apple-Google battleground. Of course, if you've been reading the tea leaves, Apple's move into mobile advertising is anything but surprising. In January, they bought mobile advertising company Quattro for a reported $275 million, after Google snatched AdMob out from under them months before. Apple Buying Mobile Advertisting Company Quattro Wireless for $275 Million? More recently, we saw glimpses of Apple's mobile advertising future in an "App Store Tip" they published which discouraged developers from creating apps that "use location-based information primarily to enable mobile advertisers to deliver targeted ads based on a user's location." Because that's exactly what they want to do themselves, of course. MP's sources say that Steve Jobs has described iAd as "our next big thing" and "revolutionary," natch.